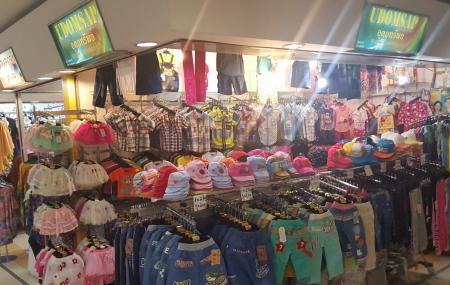 The Indra Square is a popular shopping Mall that offers an extensive range of accessories, clothing, bags as well as shoes at bargain prices. This is also a good place to get your hands on souvenirs. There’s also a food court on the top floor of the Mall with options for Thai Food as well as vegetarian and Indian specialities. Sales and discounts are often offered while if you possess the bargaining skills, they would come in handy here. Located at a very convenient location and offering items at wholesale rates, the Mall attracts locals and tourists alike. How popular is Indra Square? People normally club together Lumpini Park and Central World Plaza while planning their visit to Indra Square. It is a cheap market for average products. If you want to buy fashionable apparels or dresses, it will disappoint you. This is one storied market with lot of shops. You can buy everything from here. You can buy dresses, bags, luggage, leather items, watches, souvenirs, suits, undergarments, chocolates, electronics and so on. I bought some vanity bags, a luggage, Polo t-shirts and most importantly chocolates. The price is the main satisfaction of this market. Before buying, please check the products carefully. Few shop salesmen, sales girls and lady boys insist you to buy more but you should be firmed on your decision. Usually market is safe for shopping. Good bargain market which is very congested. Positive thing is that you could find almost all the things here from cloths, accessories to electronic items but as it's a cheap market so the quality is also cheap more like left over from Chinese markets. Lot of shop owners or sales persons were Indian, Nepalis and Burmese origin. If you purchase they behave very good and if you don't they become very rude. Although it's like in every part of the world in tourist markets. As it is cheap so you can purchase lots of different items as gift for friends and families back home. I recommend even if you are not interested in purchasing but must visit this place. Good Market with lots of options. Things are cheap and of good quality. Must visit if you are looking for shopping that Bangkok is famous for.